Though the clocks sprung forward with the welcome of spring, on Monday March 11th, the sun set early on Black Mountain. The crisp, sun-drenched Canadian flag which once saluted all who departed a loving home on Verde Vista Road, hung without a breeze as Warwick “Critch” Critchley, the man who proudly displayed it for all to see, passed away peacefully in his sleep surrounded and comforted by the ones he loved. He was 82. A native son of beautiful BC, Critch was born in Merritt on January 3, 1937 and left home to join the Canadian Armed Forces (CAF) when he was only seventeen years old. His service in the CAF took him to faraway places across Canada and around the world, but he’d tell anyone who asked, the best view he ever laid eyes on was from the sundeck on his Black Mountain home, overlooking God’s Country. An Air Frame Technician in the CAF, while at Cold Lake, Critch used his skills to build a camper with his own hands for his young family of seven to explore the beautiful outdoors that he cherished so dearly. With Wynne on his arm, inseparable since they first met so many years ago, they amassed priceless family albums overflowing with photos, ribbons and local write-ups as their family grew and shared cherished moments together. Critch and Wynne were perfect together is so many ways including their incredible dance floor dexterity. When they danced together at family events, all stood back and took notice of what true love really looks like. Critch’s greatest accomplishment, however, was his children. 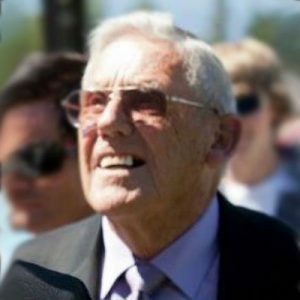 Critch was continuously involved in all aspects of his children’s and grandchildren’s lives. From coaching the boys in hockey (and his daughter Kathy – the first female to play hockey in the city) to sewing Halloween costumes and sporting uniforms, to creating elaborate Christmas decorations for the family, he invested in his children with every penny he owned, and because of that, he was richer than any man. Critch is survived by his loving wife of over 61 years, Ceinwyn, and their children: Steve (Patti), Dave (Debra), Don (Janet), Kathy (Julie), and Susan (Chris); grandchildren: Bonnie (Sarah), John (Chelsea), Jennifer (Brandon), Sarah (Joel), Cody (Erika), Donny, Naomi (Aaron), James (Christina), and Victoria (Austin); and great-grandchildren: Ava, Ellis, Memphis, Mariah, Riley and three more on the way. A Memorial Service and reception will be held on Saturday, April 6, 2019 at 1:00 pm at Springfield Funeral Home, 2020 Springfield Road, Kelowna BC. In lieu of flowers, donations can be made to Central Okanagan Hospice Association www.hospicecoha.org. The service for CRITCHLEY, Warwick Thomas is scheduled for Saturday, April 6, 2019 at 1:00 pm . Below you will find the map for the service location and the contact information should you have any questions.